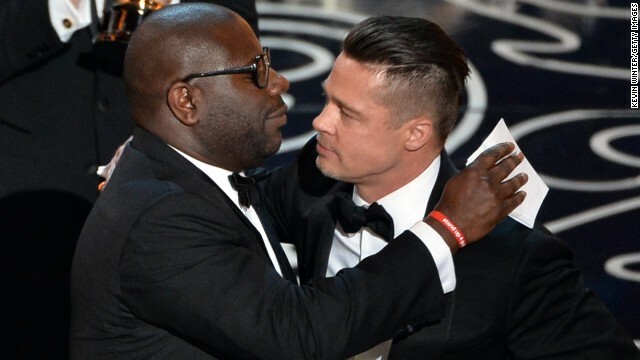 Director Steve McQueen (left) hugs producer Brad Pitt after winning the best picture Oscar. Director Steve McQueen's Oscar-winning film may have been about historical slavery, but he doesn't want the world to forget such horrors still exist. During his best picture acceptance speech Sunday night, McQueen made poignant mention of modern-day slavery. "Everyone deserves not just to survive, but to live," he said. "This is the most important legacy of Solomon Northup. I dedicate this award to all the people who have endured slavery, and the 21 million people who still suffer slavery today." The British director is a patron of Anti-Slavery International, an organization that seeks to draw attention to an eradicate modern-day slavery around the world. ‘I am truly honored to have been asked to become a patron of Anti-Slavery International, the oldest anti-slavery organization in the world," McQueen said in a statement on the organizations website. "'Right now, there are Solomon Northups in every region of the world who have been taken away from their families and placed in slavery. I hope that 150 years from now a film will not be made about our ambivalence to slavery. We have to do something about it." Next entry »How did Ellen DeGeneres do as Oscars host? The movie rightly deserved an award or should i say awards it was inspiring and eye opening just like a perfect pizza. 21 million still enslaved? Did he count them?